In our Auckland Atelier this year, Jason will be teaching his five day course, creating 40% life-sizes figures in clay. Students will be using the visual measurement techniques of the Sight Size Method. 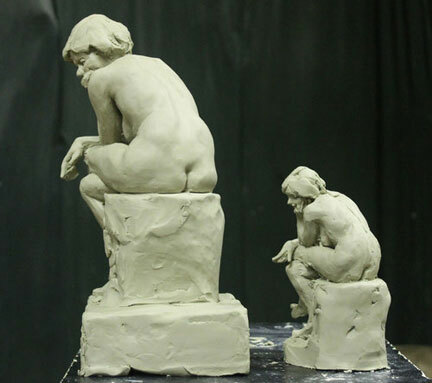 Working from a live model posed in a seated position, students will learn how to build clay figures of substantial dimensions without the use of an armature, in water-based clay. Instructor Jason Arkles will work alongside students throughout the duration of the course, providing a demonstration of techniques and practices for the entirety of the course. Please make your booking on our Atelier Website. Jason Arkles is an American sculptor working in the traditional methods and materials one would normally associate with a sculptor in Florence. His large-scale figurative work in bronze, marble, terracotta and wood can be found in public and private spaces, museums, cemeteries, and churches in Europe and America, including on the facade of Saint Mark's English Church in Florence. 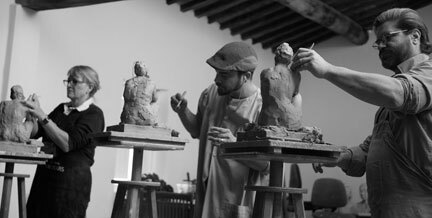 Trained locally in the studio of Charles H. Cecil (the human figure in clay), in Studio Sem in Pietrasanta (marble), and in a Pontifical Academy in Rome (sacred art), Jason himself now runs a small teaching studio in Florence, Studio Della Statua, in tandem with his professional career. Regarding himself as a practitioner of sculpture rather than an academic, Jason nevertheless has presumed to self-publish two small books on sculpture; Sculpting From Life, a manual for sculpting in clay using a living model , and the other, a translation and commentary on Leon Battista Alberti's Della Statua. he is currently working on his third, which will detail the history of visually- oriented sculpture technique as practiced in the ateliers of 19th Century France. Jason has become a popular and sought-after lecturer on art history, bringing to the lecturer's podium the perspective of a practitioner rather than that of an art historian. Jason has given lectures on sculpture at the 'big three' ateliers in Florence - Charles H. Cecil studio, The Florence Academy of Art , and the Angel Academy. He is also on the History of Art Department at the British Institute of Florence, and has in the past given an entire season of lectures in conjunction with the St. Mark's Cultural Association in Florence, which spanned the whole of the Western European tradition of figurative sculpture. After receiving numerous requests to put his engaging lectures online for others to enjoy, the idea for the podcast, The Sculptor's Funeral, was born.